Description Apply user-defined mutes (angle, offset, hand-drawn) to gathers. This process applies inner and outer mutes to gathers. Mutes can be hand picked or defined by angle (see Manually Picking a Mute and Creating an Angle Mute). At the tab header, click Add icon and select New Process. In the Details Panel at Volume, select the gather volume to mute. 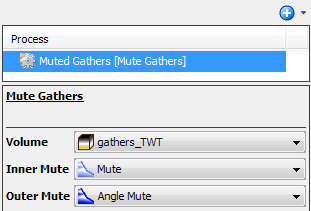 At Inner Mute, select the mute line to mute the gather below this line. 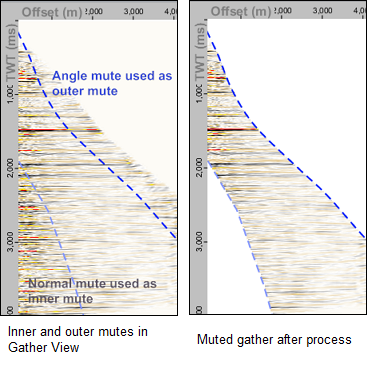 At Outer Mute, select the mute line to mute the gather above this line. 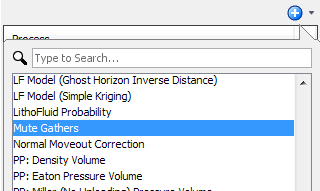 As a result of this process, a new muted gather volume will be available in the Volume tab.